Sterling has been the underperformer among G10 FX space, thanks to the chaotic Brexit process to date. The Q1 outlook for cable is still binary: either a friendly Brexit or not. 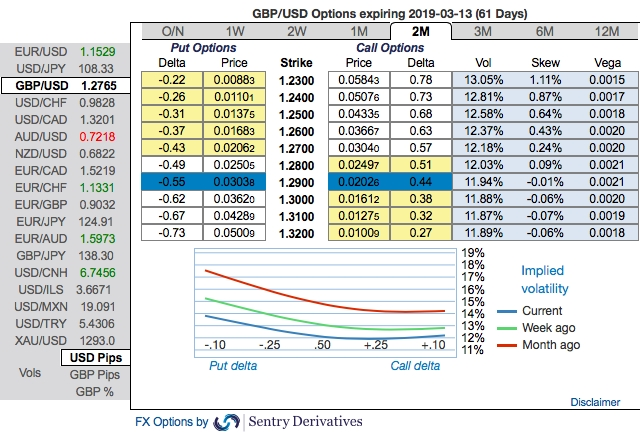 It remains more expensive to hedge against strong GBP depreciation, which means that an orderly Brexit in whatever shape is still seen as being more likely. However, the risk of things going wrong is high and as a result, we regard any GBP appreciation with much scepticism. Even if you see any fresh positive bids in risk reversals to the existing bearish setup, it should not be perceived as the bearish scenario changer. The UK Parliamentary developments ahead of next Tuesday’s “meaningful” vote will continue to dominate the domestic focus through today’s session, as we go into the third day of debates on the EU withdrawal agreement in the House of Commons. The recent passing of two important amendments - one limiting the government’s ability to use fiscal policy in the event of a ‘no deal’ scenario (not approved by MPs) and the other requiring the government to report back to the Commons on its ‘Plan B’ within three sitting days (by 21 January) if PM May’s deal is rejected – has seen the implied bookmaker odds of a ‘no deal’ in March fall from 35% to 20%. Research by BBC Politics suggests the government may lose the vote by a 200+ margin. Data wise, we forecast November GDP will show the UK economy continued to grow through the last quarter of 2018, in spite of ongoing concerns about the potential impact of Brexit. We expect a monthly rise of 0.2%, which would result in a rolling three-month rate of 0.3%. The latter figure suggests that Q4 GDP growth may be close to half of the 0.6% growth rate seen in the third quarter of last year. A likely slowdown in final demand may be partially offset by firms stepping up their preparations ahead of Brexit. Survey evidence suggests that this may be happening in the manufacturing sector. Accompanying the GDP release will be the industrial production report, which we forecast to show a strong rebound in manufacturing output by around 0.8%. Sterling appears to be untradeable and remains in the firm grip of the ongoing Brexit drama, amid this uncertainty, the British currency doesn’t seem to have discounted most of the bad news on current levels still. Currency Strength Index: FxWirePro's hourly GBP spot index is flashing 89 (which is bullish), while hourly USD spot index was at -118 (bearish) while articulating (at 11:31 GMT).